Designed to impart a classic and much-lauded tone upon your electric guitar, the JVM210C from Marshall Amplification is a two-channel 2x12" combo amplifier featuring 100W RMS of power. Both of its channels boast three specific modes to boot, giving you a total of six different timbres to choose from at any one time. You can cycle through modes in one of two ways: with the mode buttons next to the gain knobs or with the provided footswitch. Either way, mode selection introduces different types of gain, allowing you to soar into the ethereal planes of heavy metal, to reach back to the days of the plexi, or to seek the clean for tonal inspiration. The JVM210C also offers separate reverbs and master levels for each channel. This amplifier does have its own 2x12" cabinet, but if that's not enough, you have no less than 5x 1/4" speaker outputs at your disposal for connective purposes. These outputs are wired to handle between 4 and 16 Ohms, giving you the ability to hit a variety of different kind of cabinets, should you so choose. The JVM210C features an effects loop whose mix knob controls how much of the effected signal you want in the chain. There's also a switch between +4 dBu and -10 dBV for different types of gear. The JVM210C also sports a power amp insert and serial loop, allowing you to connect effects right before the master control, or to plug-in other preamps into the JVM10's power amp. Should you wish to connect straight to a mixer, recording device, or PA, an emulated XLR line-output slaps the sound of a 4x12" Marshall cabinet onto your signal, so that the sound going into the board more closely approximates the signal coming out of your amp. Add some additional tonal shaping with the resonance and presence knob. With its built-in MIDI thru/input, you can customize operation of the provided footswitch to include commands for other MIDI equipment, as well as save up to 128 different MIDI presets. Thus, you can choose between pre-coordinated effects loops instantaneously onstage-particularly useful if you have complicated effects-processing setups in a single song. 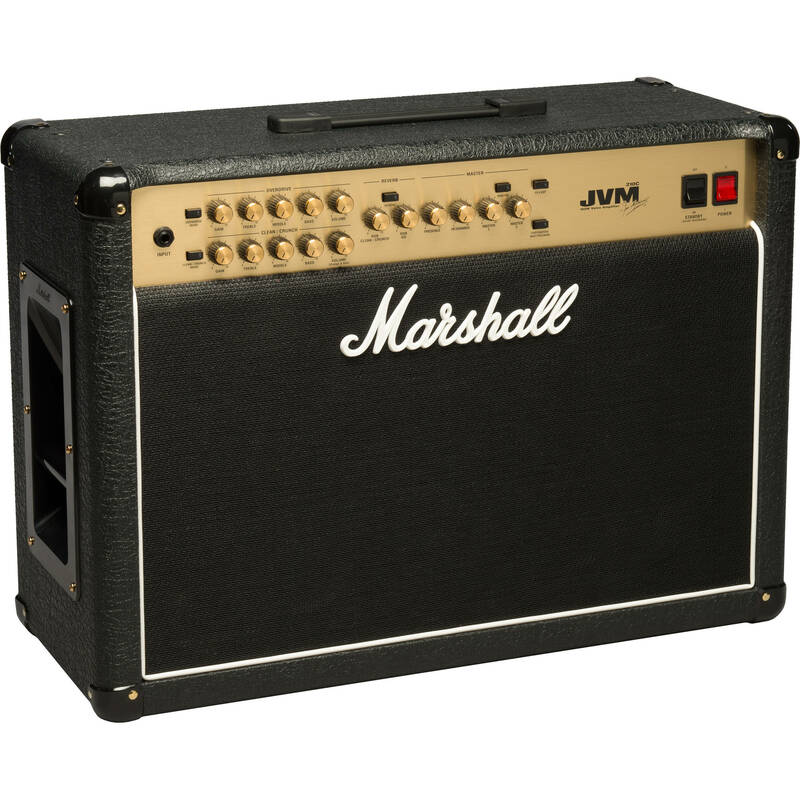 The JVM10C features a 2x12" cabinet with two Celestion speakers: one Heritage and one Vintage.